KTM seems to be on a roll in the Indian bike market with the success of the 200 Duke and the 390 Duke and is looking to capitalise on this with the launch of their faired cousins, the RC 200 and RC 390. The KTM RC 200, based on the popular 200 Duke, is the more road-usable variant in the RC series of bikes. It has all the parts that help it steer faster, accelerate faster and handle better than most other bikes in its category, but the smaller engine ensures that beginners can enjoy all that without having to worry about too much power. KTM and Bajaj have spent a lot of time making sure that the RC 200 suits riders in India, let us find out what it offers. The KTM RC 200 has been launched at a price of Rs. 1.60 Lakh, ex-showroom Delhi. The closest competitors in terms of engine capacity in the class are the Hero Karizma ZMR and Honda CBR 250R. The Honda CBR 250R is priced between Rs. 1.53 Lakh to Rs. 1.87 Lakh and its 249.6-cc engine delivers 24.9 BHP and 22.9 Nm. The Hero Karizma ZMR is priced at Rs.1.01 Lakh and its 223-cc engine delivers 19.9 BHP and 19.7 Nm. The KTM RC 200 delivers 25.4 BHP and 19.2 Nm. There is little to differentiate the KTM RC series of bikes from each other, the RC 200 gets the same sharp deisgn as its sibling the RC 390. The RC series of bikes gets aggressive front fairing complimented by the projector lamps which sit recessed within the fairing scoop. The models sold in India will be offered with LED DRLs to give them a bit of bling factor, Indians love DRLs! Another clever touch is the reaer-view mirror housing integrated indicators, these look cool and also reduce the frontal area of the bike for better aerodynamics. Move to the side and you notice the huge (and in most cases, bright orange) 10-spoke wheels, the sharp fairing, huge tank, underbelly exhaust and the cleverly integrated pillion seat. The RC 200 is meant to be ridden and the pillion seat is there just as an accessory, the pillion will be sitting pretty high-up which is not the best way to sit on a high-performance bike. Move to the rear and you will notice the slim LED brake lamp, and a short number plate holder that also holds the indicators. The KTM RC 390 provides some first-in-segment features like projector headlamps, here’s a list of all the features. The KTM RC 200, like all other bikes from the manufacturer in India, provides the best performance-for-the-money proposition. A lot of changes have been made to set the RC 200 apart from the 200 Duke. The steel trellis frame has been tweaked and the engine has been used as a stressed member. The rake angle at the front has been reduced for faster turns and the wheelbase has been shortened for sharper handling. The RC 200 is tuned more towards daily-rideability than for all-out on-track performance like the RC 390. 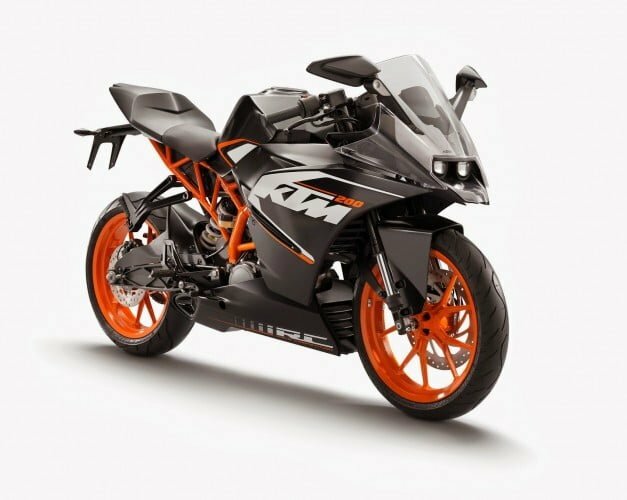 KTM is not offering ABS on the RC 200 as it says that the standard brakes can easily handle the bike; also adding ABS would have reduced the value-for-money proposition that the RC 200 offers.